‘Ed Reardon’s Week’ is a cleverly funny comedy series on BBC Radio 4. Its protagonist is a grumpy, disillusioned writer whose highest achievement was the scripting an episode of the cheesy early-80s BBC TV series ‘Tenko’ – an achievement on which he still dines out. Since then he’s scratched a living as a writer of hack pieces, while teaching a desultory evening class in creative writing to a group of jaded, equally cynical pensioners. When I discovered that this opinionated failure was based on the central character of George Gissing’s 1891 novel New Grub Street I knew I had to read it. I was not disappointed. It’s deeply moving, and a scathing portrait of the lives of struggling writers in Victorian London, striving to make a living in a literary world, like Ed Reardon’s, which seems to be run by ignorant plutocrats supplying crass product for an undiscerning, low-brow public of equally ignorant consumers. People have got that ancient prejudice so firmly rooted in their heads – that one mustn’t write save at the dictation of the Holy Spirit. I tell you, writing is a business… There’s no question of the divine afflatus; that belongs to another sphere of life. We talk of literature as a trade, not of Homer, Dante, and Shakespeare… I don’t advocate the propagation of vicious literature; I speak only of good, coarse, marketable stuff for the world’s vulgar… I maintain that we people of brains are justified in supplying the mob with the food it likes. His plan is to milk his family’s small financial resources – his sisters will have to fend for themselves by becoming hack writers also (for the children’s market, naturally, as they are mere ignorant girls!) – in order to network with important literary and journalistic contacts, flattering and flirting with the rich and influential. Authorial merit has little to do with commercial success; ‘modesty helps a man in no department of modern life’, he declares. His polar opposite is Edwin Reardon. After some modest success with his first few novels (traditional three-deckers) his star is waning. He receives less money for each successive book; if it weren’t for the small fees he earns for earnestly academic articles he publishes in literary journals he’d already be penniless. He’s headed for penury. As his plight worsens, his wife’s support declines. Amy, a beauty, had married him mostly because she relished the prospect of being feted as the wife of a successful author – and of being rich. Eventually they separate; she can bear his blocked, sullen artistic sterility and refusal to compromise no longer. He meanwhile is rendered unable to work because of her hostility, and the pressing urgency to produce fiction just to pay the bills. Inspiration has deserted him, as poverty has dried up his source of stories. The main interest in the novel rests in the painful decline of poor idealist Reardon. As it reaches its climax this plot pitilessly traces his tortured inner struggle: should he compromise his artistic soul and sell out, as Milvain, Amy and others repeatedly urge him to do? The answer has tragic consequences for him. This desperately heart-rending story is counterpointed by the career of Milvain, whose tactics work so well that his success is as stellar as Reardon’s downfall is crushing. After a brief dalliance with Marian, who briefly becomes an heiress, he’s forced to make a critical decision. As with Reardon, the outcome is cruelly exposed in Gissing’s unstinting prose. This is so much more than a critical attack on the petty squabbles and liaisons of the moderately talented literary figures of the time; it’s more a serious examination of what it is that drives people to become authors, to expose their most intimate and sensitive selves to public scrutiny, often to meet with derision, dismissal, or, worst of all, indifference. As a portrayal of that part of late Victorian London it’s fascinating, emotionally draining (in a good way) and powerful. As a three-decker itself it’s probably 200 pages too long (it has 551 pages in my Penguin Classics paperback, bought at the Oxfam shop near Chiswick Park underground station when I was visiting friends last month). There are longueurs; Milvain and Reardon are given far too many speeches in which they reiterate their philosophies at wearying length; there are some colourful minor characters, but they fail to enrich the narrative as inventively as Dickens’, for example, in whose shadow this novel inevitably falls. It is perhaps a little too relentlessly dour; the talented few are dashed down, fail, while the greedily talentless thrive. The romantic/sensational elements of the plots descend into the cartoonish and clichéd at times. For two or three hours Reardon had been seated in much the same attitude. Occasionally he dipped his pen into the ink, and seemed about to write: but each time the effort was abortive. At the head of the paper was inscribed ‘Chapter III’, but that was all. And now the sky was dusking over; darkness would soon fall…[O]n his face was the pallor of mental suffering. Often he fell into a fit of absence, and gazed at vacancy with wide, miserable eyes. Returning to consciousness, he fidgeted nervously on his chair, dipped his pen for the hundredth time, bent forward in feverish determination to work. Useless; he scarcely knew what he wished to put into words, and his brain refused to construct the simplest sentence. The colours faded from the sky, and night came quickly. Reardon threw his arms upon the desk, let his head fall forward, and remained so, as if asleep. 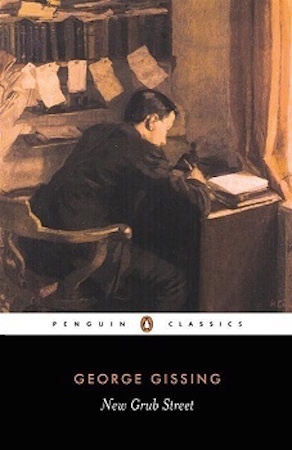 This entry was posted in English Literature and tagged Ed Reardon's World, George Gissing, New Grub Street by Simon Lavery. Bookmark the permalink. Yes, it’s very moving, isn’t it. Poor chap doesn’t have much luck for the rest of the novel. Wonderful, Simon. Have been so busy with work/life etc. that am terribly behind reading your lovely pieces. Will make amends. Great quotes, but 200 pages too long? Ouch. A sense of bloat is what’s always put me off this. Still a powerful narrative, though. Worth persevering with.